Please fill out the form listed below should one have any inquiry or suggestion. - make innovative ideas happen. Salary and reward are 20% higher than the industry average. We provide inspiring working environment. We encourage innovations.We encourage our partners to face failure positively and learn from it to grow. We share profits with our partners. Our nonlinear benefit package is designed to encourage team members to create value for the company. We plan to go public in the future, and will carry out attractive equity incentive program to share the company's success in the future. Basic monthly salary: based on roles and responsibilities. 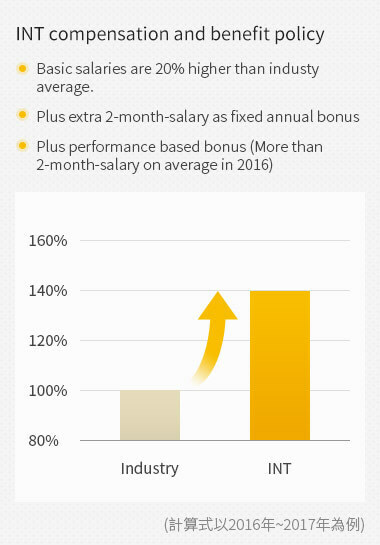 Performance based bonus: Depending on the accomplishment of corporate operational goals. Exp. 2-month-salary on average in the first year (2016). Basic salary of new employees will be reviewed after 3 months according to their performance. In addition, we also conduct annual salary adjustment. A committee decides annual salary adjustment budget and policies based on the external competition and internal fairness, as well as short to medium term strategic goals. Budget of overall annual salary adjustment depends on the accomplishment of annual targets. The higher targets are achieved, the higher budget will be approved. In any case, the partners with excellent performance will be rewarded with above-market-average salary adjustment. We provide better than obligatory physical examination plan to track employee's health status, and provide personalized health advice. We provide subsidies for social occasions such as wedding, funeral of the family members, hospitalization and etc. We have team-building activities and festival events.